YES, that’s right – we only have two seasons. As a Trinidadian, we basically know whether we prefer the sunny weather in the first half of the year, as opposed to the wet, rainy weather that is rampant in the second half of the year. There are no shades of grey. We either prefer the heat or the cold (which to most of us here, means the rain). The topic of ‘the weather’ also seems incredibly boring to us. But in Japan, the weather is a topic of conversation. As Japan is a temperate country, its location presents one with the opportunity to experience all four seasons – Spring, Summer, Autumn and Winter. Each period is usually marked by changes in the weather and the environment. These changes also dictate that certain activities, crops and food are only possible for a few months at a time. . . leading to special events to commemorate the beginning of each season. Spring in Japan is usually highlighted by the blooming of the cherry blossom or “Sakura” trees. Spring is usually celebrated by friends and family meeting under the delicate pink blossoms of the Sakura tree. 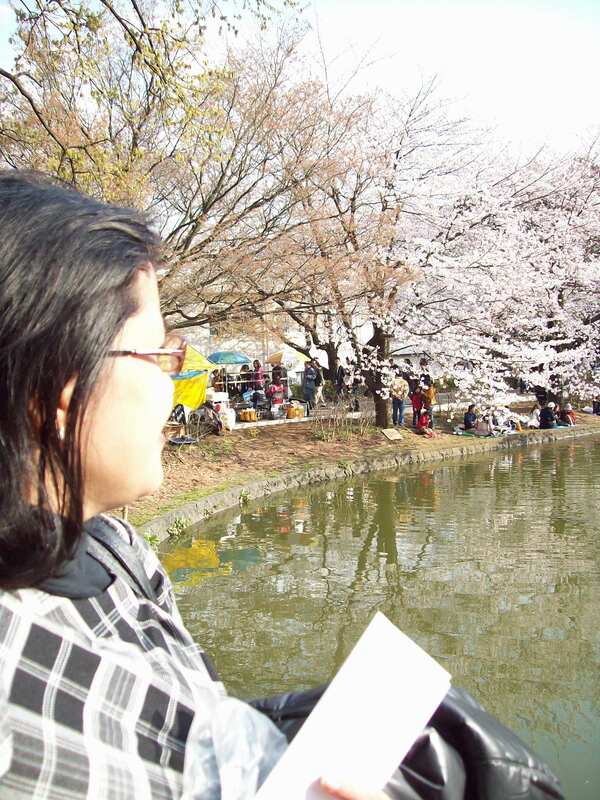 This is called “Hanami” – meaning “Flower viewing“. Picnic stations are set under the blooming trees. There, many people can be seen eating either cute bentos (which are home-made) or popular street food (like takoyaki) that were purchased from nearby stands that were set up specifically for this event. While engaged in such merriment, time is taken to enjoy the view of these delicate flowers that are in bloom for such a short time. The Japanese seem to have attached a deep meaning to the Cherry Blossom and the event of its blooming.Its significance may be tied to important life events and changes in one’s life in Japan. Unlike Trinidad, Japan’s new school year begins at this time- around April. Government institutions also rotate their staff across different departments / locations / areas too. Seeing the cherry blossoms at this new change and part of life is what may be the key that further resonates a deeper nostalgic and sentimental feeling between cherry blossoms and the Japanese heart. To me, it seems to represent the fragility and fleeting life of the world and the moments it is made up of. It also seems to signify renewal, or a new, fresh beginning in life. People also use this time to clean their homes and cleanse it of bad spirits. The Setsubun Festival celebrates this cleansing at temples all across Japan. 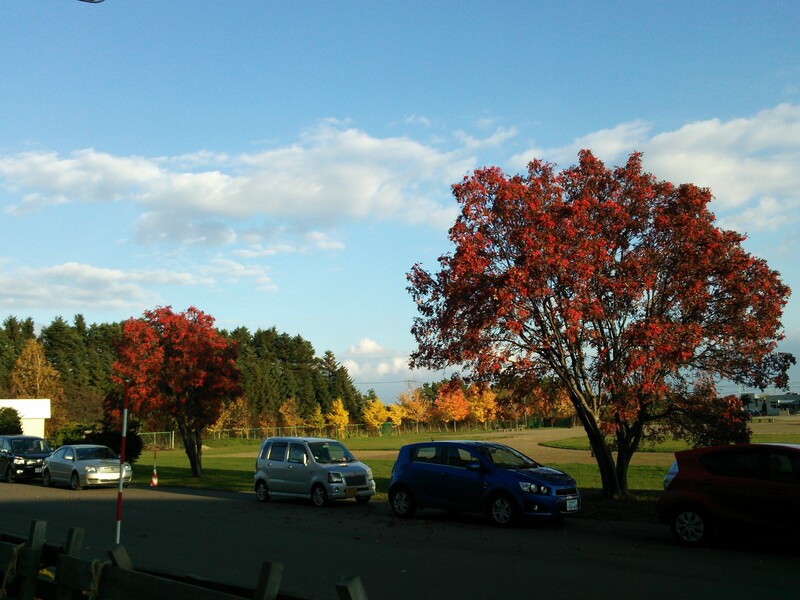 Although Spring lasts for a few months in the mainland of Japan, Hokkaido is different. It could last for only about a month. The viewing of the sakura is also very short – only a few days! Scattered showers and warm days are typically experienced during Spring. This paves the way for the melting of snow and young, green shoots emerging from the once cold ground. Preparation of fields for rice planting. To take advantage of the rainy weather, seeds and seedlings are normally planted during this time. Some of the crops, like watermelon for example, would be ready for consumption by summer. 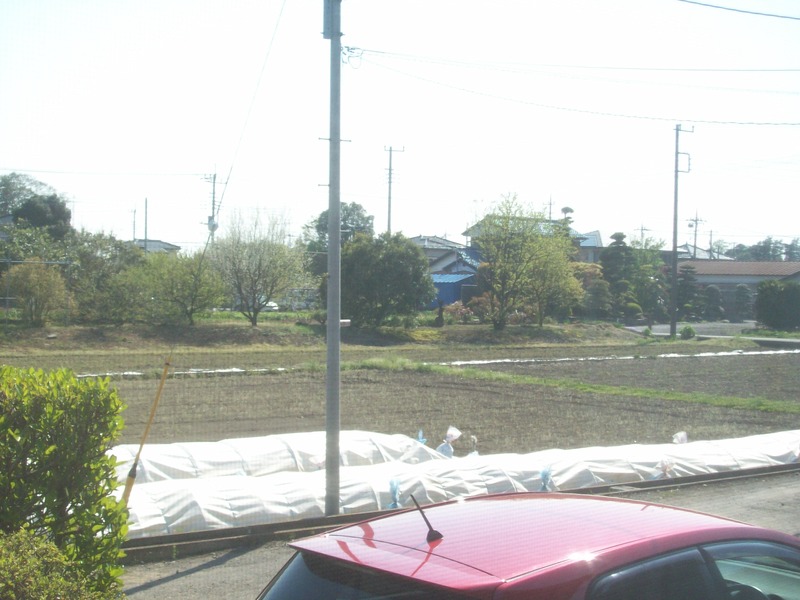 Other crops, like rice, would be ready to be harvested by autumn. Sorry that this is a little blurry. 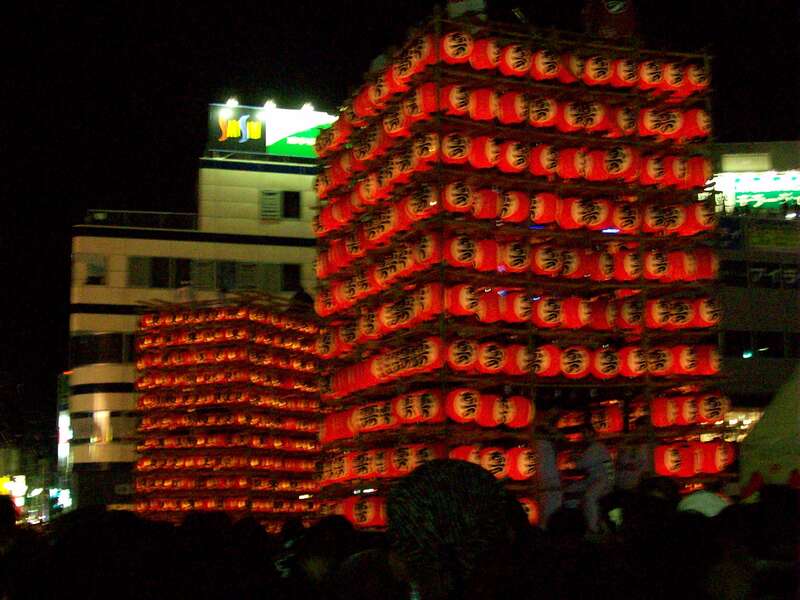 The Tower of Lights as seen here in Kuki’s Matsuri (Saitama) were spinning so fast! Yes, SPINNING! Boy. . . was I ever so wrong! In Trinidad, even though it is hot, there is still a lot of breeze. Not in Japan, my friends. The air is still as the heat swells. The body automatically compensates for the absence of breeze to cool the body by cooling it itself. Basically – you are constantly sweating. It really is just like in the animes and manga that so many of us are fond of: the complaints of the heat, feeling like passing out, thirsty, fanning, the wearing of lighter clothes, the excursions to the beach and the pool – all in the sake of cooling oneself of the incessant heat. Even the nights are incredibly humid! Because Japan is environmentally conscious, there is a restriction on how low one can set the temperature of their air conditioning units : 23 degrees celsius.Believe me, you would still feel very hot! That is why looking for alternate ways of cooling oneself becomes so important! Even when you go to the malls, people distribute free bottles of water to everyone. This is because the heat is so intense during this time, that around two hundred people a year die of heat stroke in Japan! And during this time, there is very little rain! So the heat keeps building! As a precaution, be sure to wear caps or hats while out in the sun. Keeping hydrated is also very important during this time. But in all of this heat, there is one thing that most people look forward to: Matsuris. A Matsuri or festival is normally held in the local village or town one resides in. Each town has its own traditions – thus the festivals that may be held in one prefecture / county of Japan may differ greatly from each town / village there. That is why people attend so many festivals across Japan. 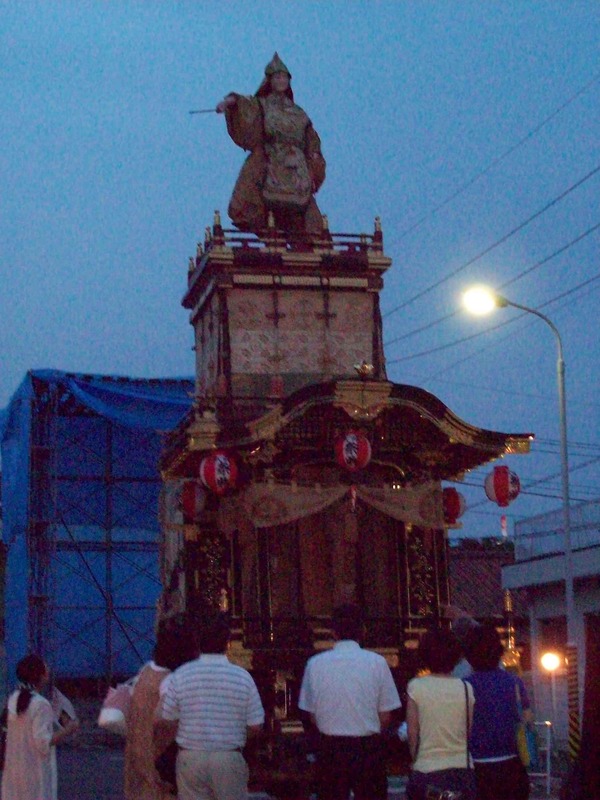 Carrying of the Mikoshi – a portable shrine of the local guardian – is conducted by some communities before the start of the festivities. Although a typical matsuri in Japan takes place over two days; in actuality, its preparations start about a couple of months before. Locals volunteer hours of their time a few times a week after school and work to make the festival a success. They are either involved in practising Taiko (playing of the large drums), cleaning of the shrine, organizing stalls and events . . . just to name a few. It is definitely a local group effort to get everything underway. That is why on the days of the festivities, locals are so jubilant and happy – they get to see and partake the results of their hard work over so many months. The first day is normally marked by a brief period of executing the formalities of opening the festival to the public.This is then followed by the opening of stalls and an invitation to the public to partake in its activities. The second day continues in much of the same way, but ends with all persons involved in preparations, etc. go out, drink (even more) and be merry! 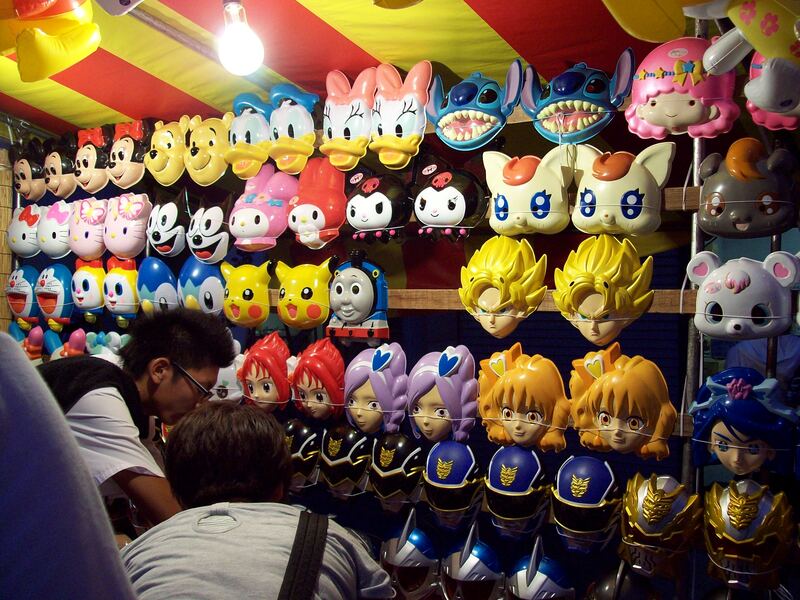 A stall selling various masks to highlight the festival at hand. One thing that is present at all matsuris – stalls! The myriad available at times could be astounding! Yakisoba – noodles quickly prepared on a grill with meat and vegetables. Edamame – blanched soy beans that are lightly salted. Takoyaki – Bits of octopus cooked a ball of batter over special grills. Yakitori – grilled pieces of meat offered on skewers. They also offer a variety of desserts – from bananas covered in chocolate to shaved ice and taiyaki (fish shaped batter that is cooked and stuffed with anko or red bean paste, custard or cream). There are also a lot of games that one could play. . . the most popular being goldfish or turtle scooping. These stalls are normally teaming with patrons – especially elementary school kids who want to try their best to capture an elusive goldfish or turtle. Do not be fooled! This is harder than it appears to be! It is mostly due to the fact that the scoop itself is made of a very thin film of paper. Once it gets wet or any weight is placed on it for too long (a matter of seconds! ), the paper would break and the goldfish or turtle would fall back into the pool it came from. 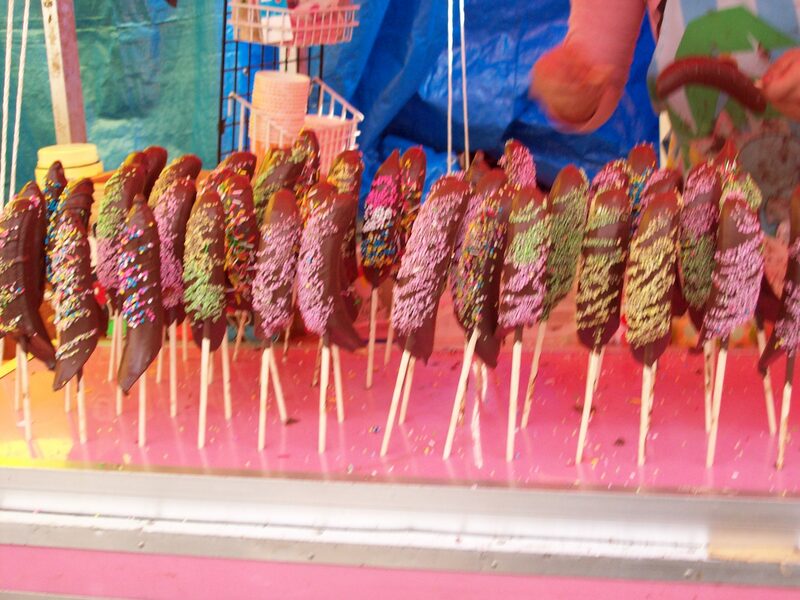 Chocolate covered bananas are a popular festival dessert in Japan. As a Trinidadian, when I heard about this festival, its activities and the fact that most of it occurs during the night, I thought that I would be up all night taking part in everything. Imagine my utter surprise when at 10:00 pm all of the music promptly stopped, stalls closed, streets cleaned and police began patrolling the area – ensuring that no one driving or riding home was drunk (in Japan, it is illegal to ride your bicycle drunk). This was my expression: ( ‘.’ ) I was really shocked. I was so familiar with our Trinidad nature of partying for long hours and days, that I believed that it was the same everywhere. I was speechless to see how early everything finished on both days! 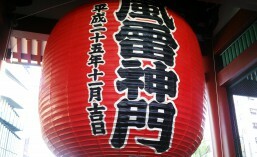 And of course, people look forward to seeing ‘Hanabi’ or fireworks after the festival. However, in smaller areas, fireworks are not always possible due to the proximity of buildings to each other. But, vast, open areas like by Tokyo Bay, annually have their summer fireworks to mark its end. In Trinidad, schools are completely desolate. Students are home enjoying the long summer vacation that is given to them. But, in Japan it is different. Schools are only closed for ONLY one month – August. Although there are no classes, teachers still come to school every day to prepare their lesson plans for the next semester, while students still come to school to partake in club activities! The arrival of Autumn could be seen in the changing colour of leaves. As it gets closer to the end of September, the days get a little cooler and the sun seems to set a little earlier. The rains return once more. Of course, as Trinidadians, we have our fair share of rain and take it a bit lightly. But the rain in Japan is not just rain. . .most of the time, there are thunderstorms! And when I say thunderstorms, I mean storms with heavy rain, very strong winds and very, very, very loud booms of thunder followed by the cracking of lightning. You will notice a lot of Japanese people screaming at the thunder, cowering and even not allowing anyone to leave a compound due to the thunderstorm. This is because it really is a serious matter. With the rain falling so heavily and lightning is everywhere, it is easy to get electrocuted or injured in some way. Plus, the torrential downpour of rain is so much at times, that when riding your bicycle to work, you end up completely drenched. More than once has that happened to me, despite wearing a raincoat. Invest in a very good raincoat. Make sure your bag is waterproof. If not, place all of the contents in your bag in a plastic bag that could fit in the bag that you are using. This would protect your stuff from getting wet and damaged. Buy a good pair of rain boots or shoes that could withstand moisture. Pack an extra set of clothes for changing. Prepare an emergency kit at home in case electricity goes – canned items, first aid kit, bottled water (and Coca Cola! ), batteries, torch lights, candles, matches, portable charger for your cellular / mobile phone. Make sure that your bicycle tires are not smooth and are fully pumped with air. Pack two extra small towels: one to wipe your bicycle seat and the other for you. 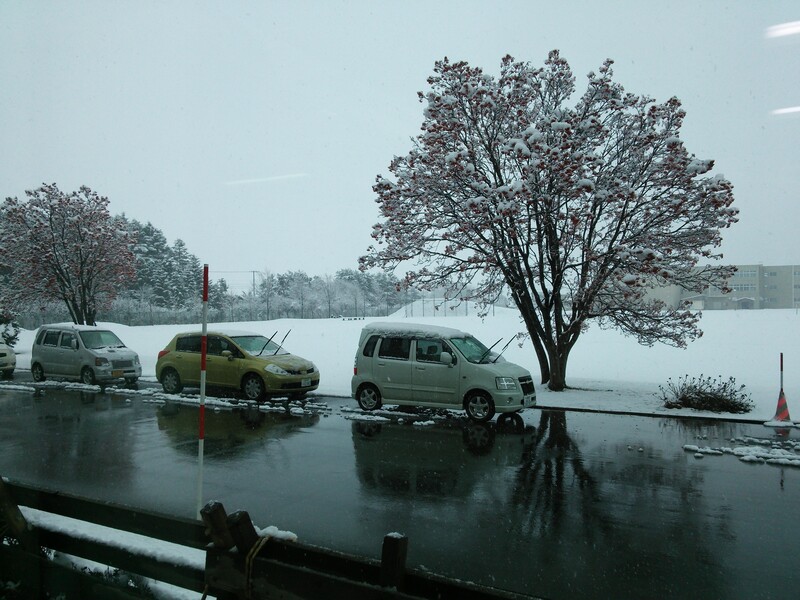 Preparations for the coming winter are also done in the colder parts of Japan – but that we would cover in another post. Harvesting of rice crops, sweet potatoes, mushrooms, etc, are also done during this time. To commemorate the harvests, on the day of the Autumn Equinox, families often gather in the late afternoon and have bar-be-ques at home. This includes the roasting of vegetables and meat over an open flame. Mittens – waterproof is best. Heat tech – these are garments worn under your clothes to keep you warm. The store Uniqlo normally offers a wide selection of heat tech for both males and females. Warmer shoes / boots with grips. Small heating packs that come in a variety of sizes for your back, shoes, socks, stomach – even to just hold in your hands. Those that come with the sticky glue are to be stuck on your garments in the specific area – not on your skin! Also, please avoid falling asleep with them on as they could burn your skin! The hand held ones would not burn your skin though. Finer yet warm clothes that facilitate ‘layering’ (this will be explained more in another post). Portable heater (if your place does not have one or you have several large rooms and need to provide heating in more than one). Depending on the area that you are residing in, you may need more items (like if you were living in Hokkaido) or less (living in Tokyo or Kyushuu for example). Be sure to ask people around you what are their normal preparations for winter, as well as figure out what works for you. A thorough list of winter preparations would be presented in another post. During this time, one would notice that the vending machines would now offer a variety of hot drinks along with their cold selections. Be sure to try the hot cocoa (very delicious and chocolatey – yum!) and corn pottage! It really warms you! Hokkaido, the most northern point of Japan, generally has a lot of snow during winter.That is why they host a number of snow festivals – particularly in the month of February – when the snowfall is at its highest. 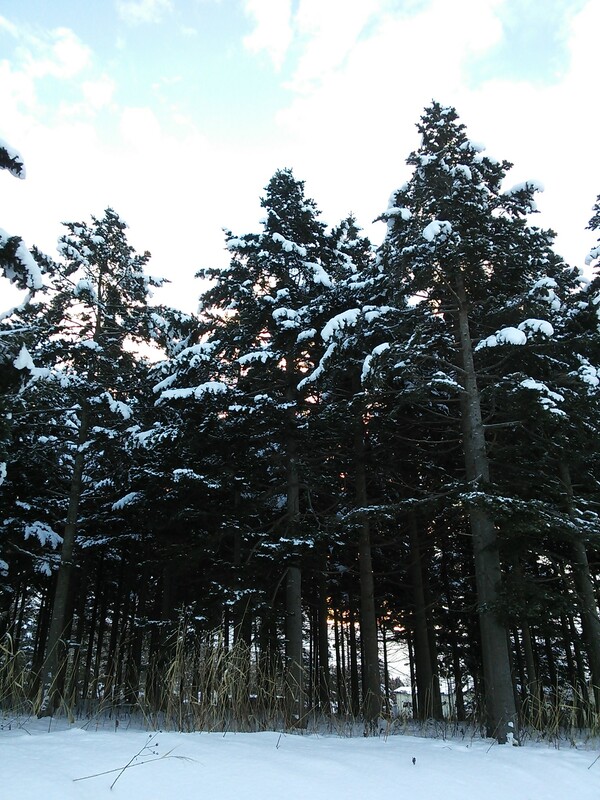 A later article covering Hokkaido’s winter in detail will be posted soon. Forgive me for the length of this post, but I hope that it provided you with a general insight and understanding of the weather and seasons in Japan, and how greatly it affects and guides the daily life of the Japanese people.